A while back there was a picture posted showing a spider mounted on the base of a steady rest. It looked like a pillar block bearing mounted on a steady rest base that fit the bed rails and had a four bolt spider inside the bearing. Barrel muzzle was held in chuck and chamber end indicated in with this spider or vice-versa. Can anyone help me locate the picture? I have worn out the search button trying to find it. What you are thinking of is an irregular shapes steady. They are seldom seen anymore and are used for holding long oddball shaped objects that can not be trued or altered on their outside or inside surfaces to be run on a center or in a steady rest. You can use them in place of a steady rest for barrel work but you have to dial in the barrel which of course leads to error. Modern steady rests have consumable surfaces on the posts so as long as the outside has been trued to centers you can put the barrel between centers, set the steady posts down on the surfaces and let the machine run that way for a few minutes until the consumable surfaces wear in to the object being turned. After that the tailstock center can be pulled away and the barrel will run true. With an irregular shapes steady, if you get one screw or jaw tighter than the rest it will push over when the center is pulled out of the barrel. This type of steady is handy if you have to do a lot of heavy machining in a steady on a part as nothing wears and gets loose. For barrel work its sort of a time waster and you would be well ahead to work in a steady rest, double cats head or 2 cats heads on the front and back of the spindle. As said you very rarely see them anymore and they are very difficult to make. They look incredibly simple until you realize that the hole that is the bearing seat must be bored perfectly to the headstock and tailstock centers of the machine. Its a bit hard to explain but because the bearing is held ridged it adds a 2nd dimension to the alignment equation. The simple way, if you want to call it simple is to cut the base to match the ways, then set it flat on the ways and while holding it there bolt it to the apron where the steady rest attaches then cut the bearing fit with a boring head in the 3 jaw and pushing it into the head with the apron. This only works on machines with adjustable gibbs on the apron. If the apron can lift this won't work. The only other way is to make the top end of the unit fully adjustable for both Y and Z axis so it can be aligned to the center line between the tailstock and headstock center. You can also make a unit that bolts directly to the cross slide but you have to dial in the Y axis of the bearing every time you use it. This is the post you are probably thinking about. The one in this post is fully adjustable. The bolts on top can be loosened to adjust the Y axis of the bearing and you can probably loosen them and add or remove shims to adjust the Z axis of the bearing. Will this lathe work for me? The one in this photo is proprietary and non adjustable and was probably bored while in the machine it was made for. The simple way to make one would be to buy a good quality pillow block with a 3 inch bore and make a base. Simple to make adjustable and then make a spider with a 3 inch OD and 2 inch ID and press it in after getting the bearing dialed in. The only problem is that quality 3 inch pillow blocks are not cheap. Here is a spider steady rest that I made for my 9A South Bend a few years back and it works great. Did you do the casting from bronze? No sir I cut down a 9 in South bend head stock spindle and all. Then turned it around and fitted it to the lathe. The custom spider can be unthreaded and a chuck installed on the cut down SB spindle. I then bored out the splindle to 1.220 could not go the full 1.250. Was not easy and took a long time fine tuning it to work good. But I can indicate a barrel in with the spider to under .0002 any time. I turn a flat on the muzzel between centers the indicate it in with the 4 jaw chuck at the same time I indicate the spider in. GOOD GRIEF ! You're a sucker for punishment. I machined one once about 25 years ago just to try. The idea was to replace the steady rest for chambering. I think I made two housings and finally had to get a guy to clue me in to how to bore the bearing seat so that it would be bang on to the tailstock and headstock center. I had initially overlooked that part of the equation when I started the project and when I finished the first and couldn't get it to line up to the tailstock center I began to see the light. I used it for a year or two but it took an extra half hour or more to set up over the steady rest so I abandoned it. Later I started floating the barrel during chambering and it definitely wouldn't work for that so I gave it to a friend. It was an interesting project but if I ever built another I would make it adjustable for Y and Z rather than try to bore it on the machine. That way it could be tweeked over if something ever got whacked out of alignment too. Starting with an old headstock with the base V and flat cut on it and the hole bored would certainly take a lot of the chaos out if the job, but there is still a lot of material to take off. The only hard part was boring out and cutting the Hardened SB spindle. As for alimement I put the cut off head stock and spindle as close as a could to the lathe head stock chucked up the cut off spindle a indicated it in then just touched up the bottom side of the cut off head stock. Only had to do this about 10 to 15 time which was a long time pain. But when I got it done happy smile's each time I use it. Last edited by coyotechet; 03-17-2013 at 10:25 PM. I need one. I will wait by the mail box for delivery Just kidding. Good for you on an particularly hard endeavor. The second line in the forst post is a link to the original thread that made me think I needed one of my own. 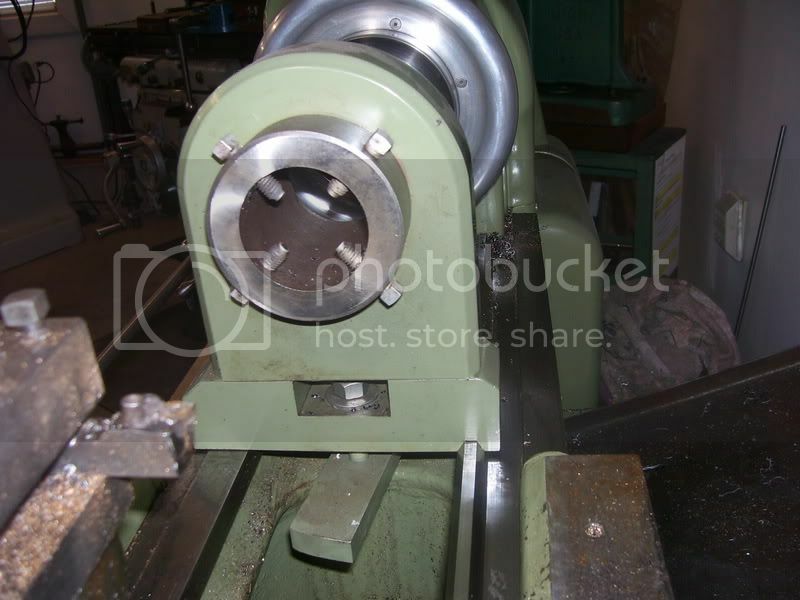 Barrel chambering with 1.450" blank and lathe spindel 1 3/8"